Hi guys i have a problem with the mfr auto brewer. i wanted to automate potions for my rainbow generator. 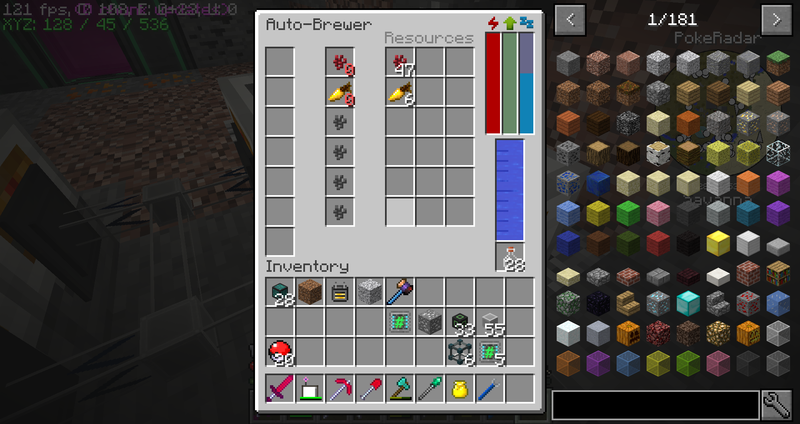 but the auto brewer wont create water bottles nor would it brew any potion if i inserted the water bottles. i think it has to do with the type slot because it shows a red 0 beneath the item. or is it because i use the beta version for 1.10.2? MY MODPACK! ~300 MODS! 1.10.2/1.11.2/1.12/1.12.2! also i noticed that a lot of stuff on the ftb wiki is outdated. e.g. the tutorial video on the link you posted. as you can see in the screenshot i submitted, i have it properly set up. energy, water and resources are supplied and the types are set or bugged to not be set. if i try to supply water bottles instead of empty ones with fluid water it still just idles. i also tried replacing the block and test it in singleplayer. first i thought it is maybe a config setting but there are almost no settings for the brewer specifically. it also won't work in singleplayer.